Bloomberg's "Flower Power" Gets Laughs at "Inner Circle"
Mayor Bloomberg got in touch with his inner hippie at Saturday night's Inner Circle charity dinner. 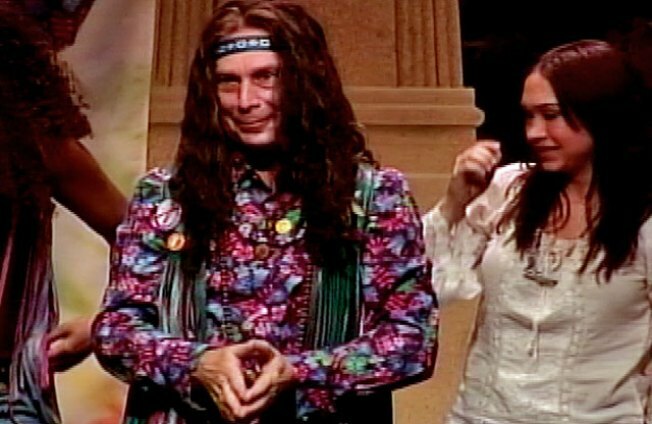 The usually buttoned-up mayor shrugged off his suit for the night, donning a headband, flower-power shirt and ripped up jeans as he played "Berg," an aging hippie in "Mair," a musical spoof of Broadway's "Hair." Bloomberg entered the stage on a cardboard Volkswagen bus and sang along to several reworked classics from the hit musical. He even got a visit from "Jersey Shore" reality stars Nicole "Snooki" Polizzi and Mike "The Situation" Sorrentino. The musical's title tune was revamped for the show into a number called "Times Square," a song about the pedestrian plaza championed by Bloomberg. The mayor's time on stage came only after he was subject to a good roasting in a sketch performed by past and present City Hall reporters. The skit took him to task for his slim win for a third term over Bill Thompson. Though not at the dinner this year, Gov. David Paterson also got a good roasting. In one skit, an actor portraying Paterson steered the Titanic straight into an iceberg. Appropriately enough, he ended up stranded on Governors Island, surrounded by "sharks," including Attorney General Andrew Cuomo and Lt. Gov. Richard Ravitch. The Inner Circle event raises money for dozens of causes, including the Coalition for the Homeless, the Museum of the City of New York and the American Heart Association.